Set in the cozy, unperturbed Bulacan, Cristina village offers the pleasure of country living yet very near Metropolis. This approximately two-hectare village is very accessible to schools, markets and churches. It is located beside a river which displays a truly comfortable and relaxing ambience. During weekends, everyone can go fishing at the river or spend time at Cristina's garden, perfect for picnics and family gatherings. 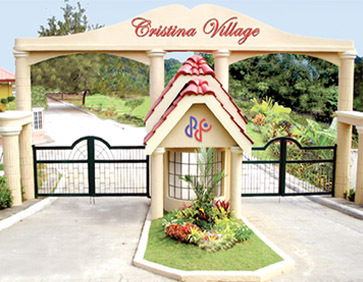 Come and experience a home sweet home only at Cristina Village. Receive newsletters and project updates. Sign up now and we will deliver it to your email. Important - The Particulars, details and visuals shown herein are intended for information and viewing purposes only and should not be relied upon as statement of fact. Accordingly, viewers of this site are invited to verify outright facts subsequently before assuming any informations contained herein. Copyright © Duraville Realty & Development Corp., Inc.